For many program participants we’ve worked with over the years, Tomika Perkins was the first Operation Dignity face they saw. More than 13 years ago, Tomika Perkins joined Operation Dignity as a member of our street outreach team, going out to serve people in encampments and help them seek housing. 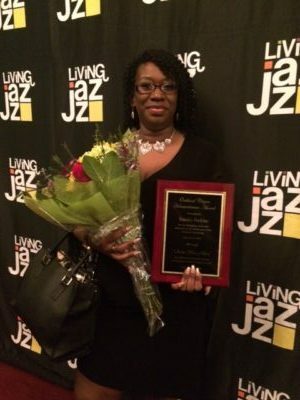 Her case management skills, empathy, and persistence have built relationships with people who are homeless all over Oakland – many of whom are now in housing with her help. Now, as our Operations Director, she not only oversees our street outreach team, but has spearheaded collaborative programs that have housed hundreds of unsheltered people in Oakland. 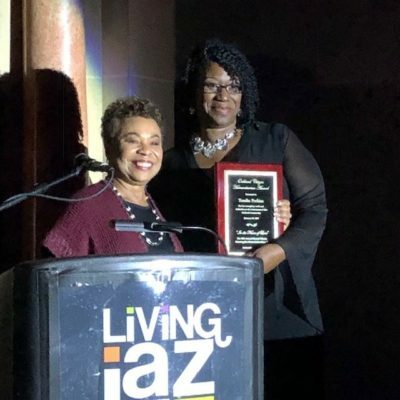 As Congresswoman Barbara Lee said when she presented Tomika with the award at Sunday’s Living Jazz “In the Name of Love” event, Tomika’s spirit of service and “magnificent leadership” are a wonderful expression of the Oakland community. All of her colleagues here at Operation Dignity are so proud and happy for Tomika on this well-deserved recognition. Congratulations, Tomika!